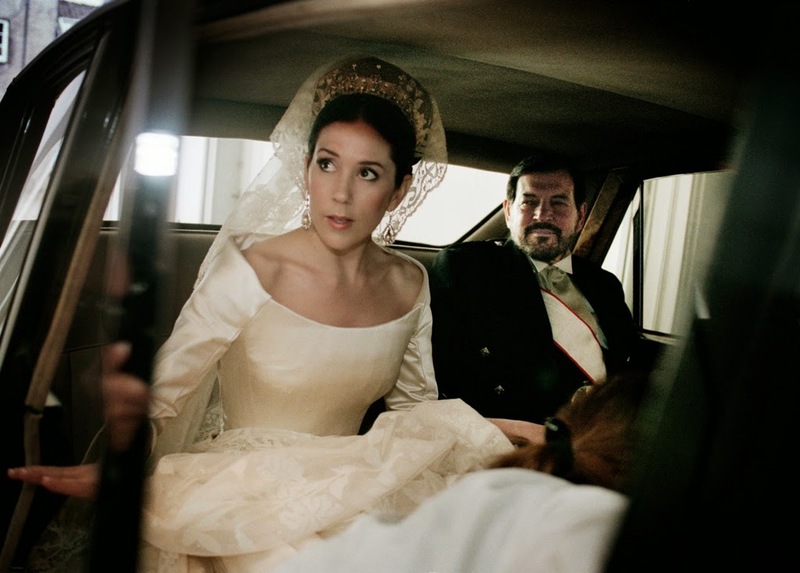 Benedikte walked into her wedding at the chapel of Fredensborg Castle in a design by Jorgen Bender. He'd made the dresses worn by both Margrethe and Anne Marie so absolutely no one was surprised when he became the pick of royal sister number three for her wedding. But when the results are this good, why would you look elsewhere? Benedikte's wedding dress was made of white silk and the design was deceptively simple. The fitted gown has an almost empire line waist that gives way to a gently flared skirt. We've got full length sleeves (it's February and we're in Denmark, it was never going to be anything else) and there's very little embellishment although those bows at the waistline are certainly eye catching. 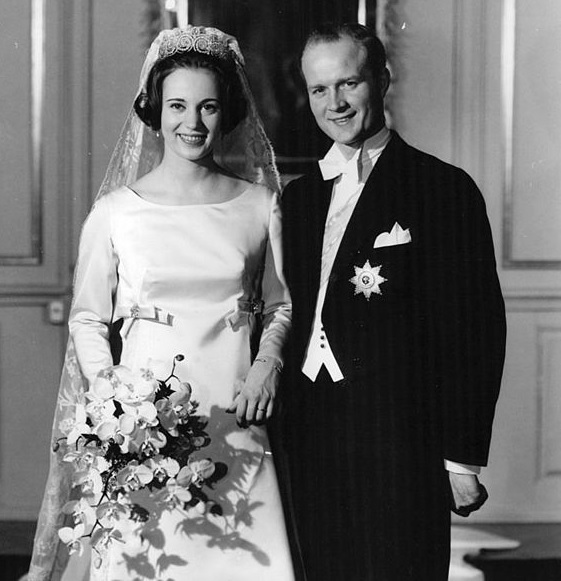 It's a royal wedding which means a train and Benedikte's was attached at her shoulders and completely covered by the heirloom lace veil which had been worn by her own mother, Ingrid, at her marriage. It had huge sentimental value as it was also worn by Ingrid's mother, Margaret of Connaught, who died tragically young. 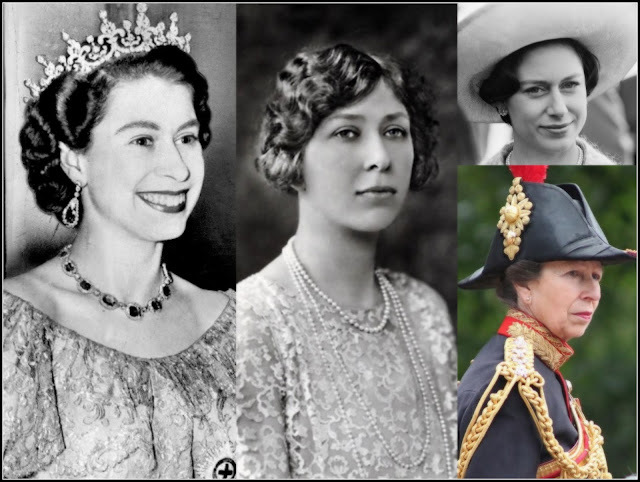 That sparkle at the top, in case you're wondering, is the Khedive of Egypt tiara - another item that once belonged to Margaret. She had received as a wedding present from the Khedive of Egpyt - hence the name - and Ingrid inherited it. Benedikte followed in the footsteps of her sisters by choosing to add these two rather lovely and very meaningful items to her wedding ensemble. Benedikte's dress looks really rather modern all these years on and wouldn't seem out of place on a bride today. It's fresh, it's modern but very regal all at the same time and the simplicity of the dress itself and the accessories Benedikte chose means it all stands the test of time rather well. This year's anniversary is bound to be bitter sweet for Benedikte. Prince Richard passed away suddenly last March so this is the first anniversary she has spent without him. But amidst the sadness, let's hope today also brings happy memories for Benedikte. She was a very beautiful bride who went on to enjoy a very happy marriage and that is always worth remembering.